Happy Sunday! I hope you continue to find my Blog useful… and that your shares have rebounded following last year’s rough market. 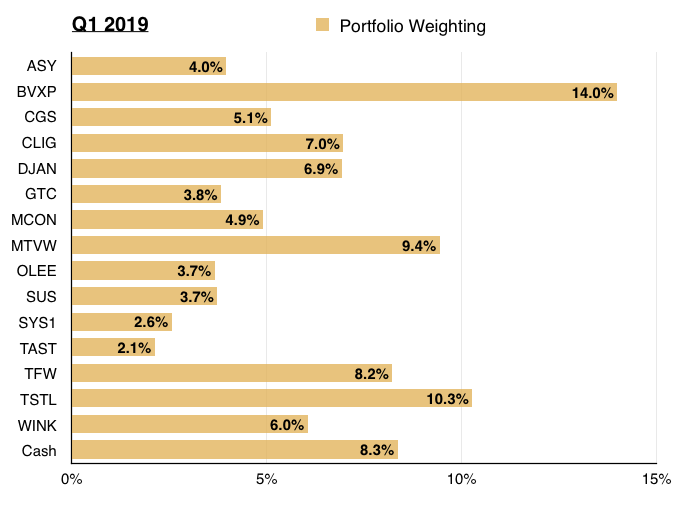 My portfolio has advanced during the last three months — although not as much as the wider indices. 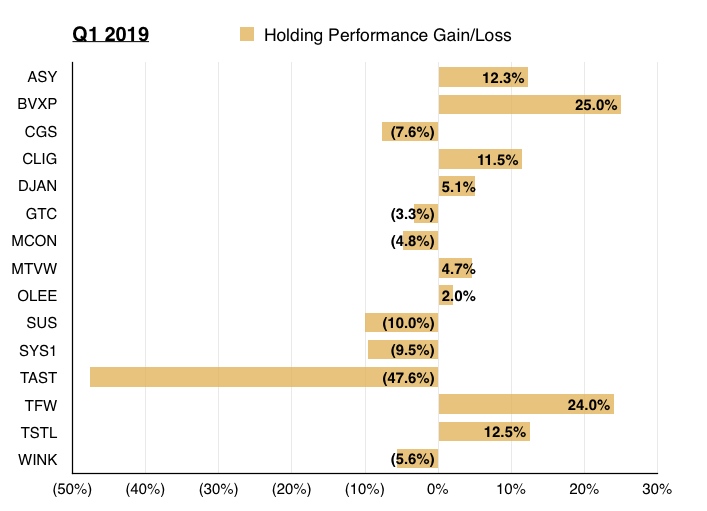 Notable price gains from Bioventix and FW Thorpe have been sadly offset by the ongoing collapse at Tasty and sluggish performances from many of my other holdings. The swings and roundabouts have meant that, for the first quarter, I am up only 3.9% versus a 9.5% gain enjoyed by the FTSE 100. Let me now explain what has happened within my portfolio during January, February and March. I made just one share trade during Q1, a top-up of Mountview Estates. I increased my holding by 10% at £97 including all costs. The regulated-tenancy landlord last declared a net asset value of £92 per share, although my sums suggest the firm’s balance sheet may be worth more than £200 per share. In addition, a yield of 4% seemed attractive based on historical valuations. My review of Mountview’s half-year results contains further details of the group’s progress and my calculations. As usual I have kept an eye on all of my existing holdings — trying to spot potential buying opportunities just in case. Nothing of significance from Andrews Sykes, Castings, Daejan, Mountview Estates, Oleeo and System1. I am particularly pleased the dividend news from my portfolio has been positive. 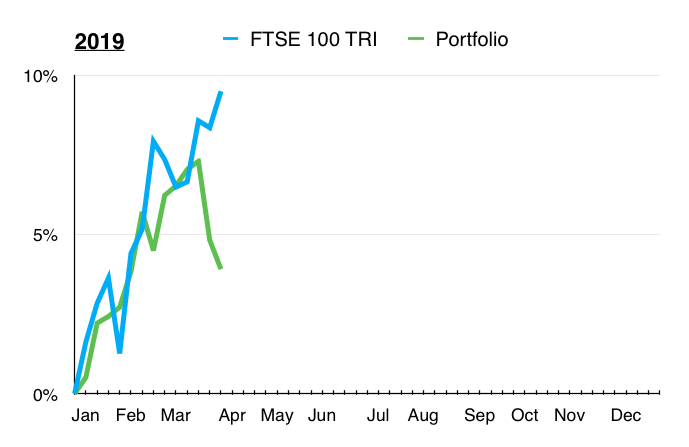 First-half dividends were raised 20% at Bioventix, 2% at FW Thorpe and 28% at Tristel. Meanwhile, full-year payouts were lifted 3% at M Winkworth, 2% at Mincon and 12% at S & U. Although City of London Investment held its first-half dividend, the company did declare a useful 13p per share special payout. My portfolio was neck and neck with the market until the last three weeks of March. 1) To enjoy a market-beating — and positive — performance: Having now written a summary of all of my shares, I could be better off concentrating more on my higher-conviction positions. 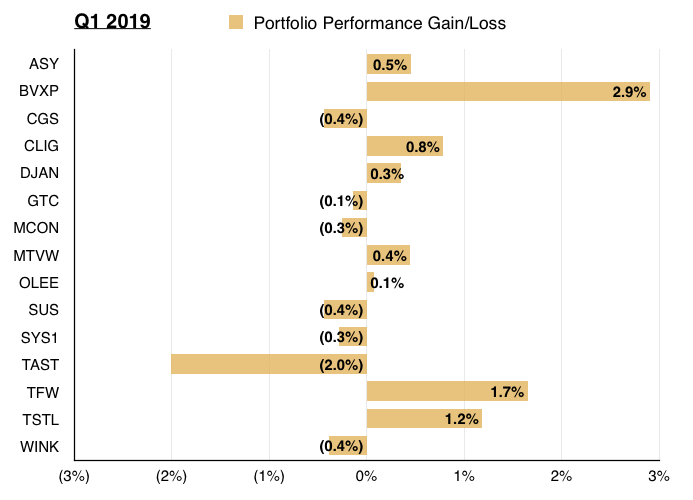 My portfolio return year to date has been positive — although not market-beating so far. I have unfortunately made no progress on concentrating more on my higher-conviction positions. I need to identify a really outstanding opportunity before I ditch some of my existing holdings. In the meantime, I continue to scan the market through my SharePad articles. 2) To evaluate at least 20 new companies: My SharePad writing schedule ought to provide me with a good flow of fresh investment ideas. So far this year I have studied Somero Enterprises, Plus500, Games Workshop, Apple, Hargreaves Lansdown, Accesso Technology and Craneware for SharePad. Seven companies in three months puts me on target to surpass 20 this year. Of the seven shares I evaluated, Plus500 (dubious management/shady business) and Accesso Technology (acquisitive history/awkward accounts) can be quickly ignored. I am not 100% convinced about Hargreaves Lansdown. The broker’s history and financials are terrific, but the high fees charged to customers leaves me uncomfortable. The super margins enjoyed by HL ought really to be ripe for disruption. Somero is a difficult one. The business has developed an attractive engineering niche and I can live with the group’s lack of recurring sales. The difficulty lies in knowing orders could suddenly dry up if/when the North American economy falters. Nobody wants to pay a fair multiple for ‘peak’ earnings — although that has not stopped the shares from doing well during the last few years. I am also not quite sure what to make of Somero’s hefty stock-option buybacks. That leaves Games Workshop, Apple and Craneware — all of which appear decent businesses. Of the three, I prefer Games Workshop due to its sector niche and greater propensity for dividends — assuming the firm’s profit surge is not just a flash in the pan. As US mega-caps go, Apple looks as good a bet as any, while the dilemma about Craneware remains the high valuation and how far to extrapolate the software developer’s long-term contract income. 3) To learn more about the cost of staff options: I performed a study on pension deficits last year and I plan to write a similar analysis about share options. Although I have started my guide to share options, the study is not yet complete. (You can read the early draft here). Writing the guide has forced me to learn more about options — the subject is deeper than I thought! Nonetheless, I now understand how easily investors can misinterpret the cost of options within a company’s accounts. The rest of the guide — which will evaluate the option plans for all of my shares — will be completed later this year. 4) To see two of my 2018 losers — System1 and Tasty — recover some lost ground: Mind you, I hoped for exactly the same recovery this time last year! Oh dear — a miracle may now be required to see Tasty recover during 2019. True, the last results from the hapless restaurant chain indicated glimmers of trading improvements. However, what really counts is how much fresh equity will be needed to shore up the balance sheet. Wishful thinking perhaps, but I am hopeful Tasty’s sub-£4m market cap for sales of £47m already prices in significant dilution. My fingers are also crossed for System1. The market-research agency has yet to issue news during 2019. 5) To enhance this Blog further: I plan to i) publish follow-on articles to How Shares Helped Me Quit The Day Job; ii) showcase more charts/features from SharePad, and; iii) perhaps introduce a proper discussion forum. I have followed up my How Shares Helped Me Quit The Day Job with The FIRE Leap: My Story To Becoming Mortgage-Free And Retiring Early. This comprehensive write-up explains how I became mortgage-free during 2011 aged 40, and made the leap from conventional employment at the start of 2015 aged 43. I am convinced anyone with a passion for shares and the determination to give up the 9-to-5 can take the same path. On the forum front, I have put out a call for enthusiastic contributors. A handful of intrepid readers have already expressed an interest and I would welcome anybody else who wants to join a quality investment discussion forum. If the forum interests you, read this first then contact me here. Finally, I have sadly made no progress with showcasing SharePad charts within my Blog. I now think that ambition will have to be left for my SharePad articles. That is everything for this quarter. Until next time, I wish you happy and profitable investing! This entry was posted in My Portfolio on March 31, 2019 by Maynard Paton. Thanks for your timely updates and deligently written articles. I enjoy each of them! All the best for the next 3 quarters of 2019.